SATURDAY, Sept. 2, 2017 (HealthDay News) -- If you're planning to be outdoors this holiday weekend, the U.S. Food and Drug Administration wants you to know that ticks are most active during the summer months. Campers, hikers and gardeners are among those at greatest risk of tick bites. Ticks are transported by deer and mice, which thrive in suburban and wooded areas, the agency warned. And, they hang around for most of autumn and even into winter if the weather is mild. Ticks can bite anywhere on the body but they are most often found in moist or hairy places. The FDA noted, however, that ticks need to feed on their host for 24 to 48 hours in order to transmit Lyme disease. There are no vaccines in the United States that protect against Lyme disease and other tick-borne illnesses, and these infections are on the rise, the FDA said. There were 40,000 cases reported in 2015 alone -- up from just 12,000 back in 1995, the U.S. Centers for Disease Control and Prevention reports. Health officials believe the actual number of infections is probably much higher, hovering around 300,000. Pain and swelling in large joints, such as the knee. Health officials urge those who suspect they have Lyme disease to visit their doctor as soon as possible. There are FDA-regulated tests for Lyme disease, including a blood test that checks for antibodies to the germ that causes the disease. But these blood tests may be inconclusive if they are done too soon after a tick bite. The FDA said it usually takes at least two weeks for the body to start developing antibodies. In many cases, doctors recommend treatment with antibiotics before Lyme disease tests results are complete. The CDC reports that people treated with antibiotics for Lyme disease usually recover fully in a short period of time. Avoid wooded, brushy and grassy areas, particularly in the summer months. 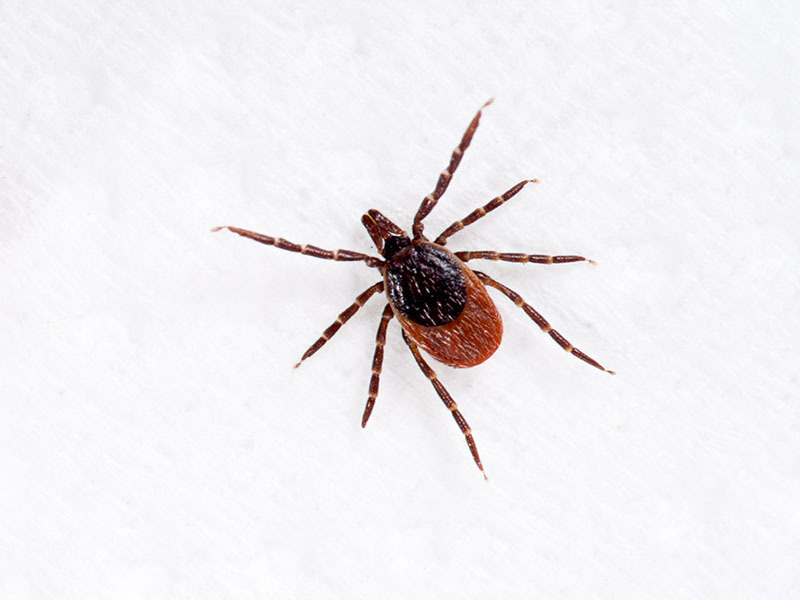 Wear light-colored clothing so black ticks are more apparent. Wear long sleeves and pants as well as covered shoes outdoors. Tuck in shirts and tuck pant legs into socks or shoes. Apply insect repellent containing DEET on clothes and uncovered skin. Avoid brush and grass while hiking on trails. Change clothes after coming inside. Wash and dry clothes at high temperatures if they've been worn outside. Perform thorough body checks for ticks after being outside. It's also a good idea to monitor pets for Lyme disease, the FDA recommends. Typical symptoms among animals include swollen joints, limping, fever and loss of appetite. Some dogs with Lyme disease develop fatal kidney disease, according to the FDA's Center for Veterinary Medicine. Just like people, dogs should be routinely checked for ticks and kept away from tick-infested areas. There is also a vaccine for dogs that can protect against Lyme disease. Pet owners should discuss this option with their veterinarian to see if it's appropriate for their dog. The U.S. Centers for Disease Control and Prevention provides more information on tick-borne diseases.